The cephalopod eye resembles that of vertebrates but evolved independently. 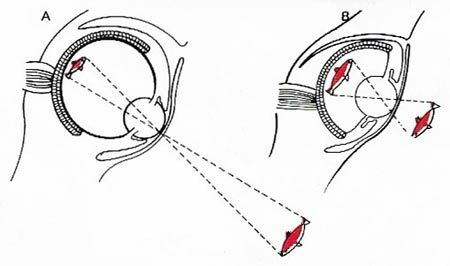 Focusing is achieved by changing the distance between retina and lens (A, B), not by lens shape changes. Although the eyes of the octopus, and of other cephalopods, and the eyes of vertebrates have evolved entirely independently, each has a retina, a cornea, an iris, a lens, and a fluid-filled interior. These similarities of structure, despite different origins, provide a classic example of biological convergence. However, the cephalopod and vertebrate eyes are also very dissimilar in some respects. For example, the photoreceptor cells in the eye of the octopus point toward the incoming light whereas our own rod cells and cone cells point backward and absorb light reflecting from the back of the eye. Another difference is that the octopus eye, like those of other invertebrates, develops as an invagination, or in-pocketing, of the skin, and not, as in the case of the vertebrate eye, as an extension of the brain. The method of focusing too is quite distinct. Cephalopods have a stiff lens of fixed focal length, which is normally focused on objects fairly nearby. The focus is changed by moving the entire lens closer or farther from the retina with the ciliary muscle. We, on the other hand, use our ciliary muscles to change the shape of our eye lens to bring objects at varying distances into focus. A unique characteristic of the cephalopod eye is its ability to rotate and maintain a constant orientation with respect to gravity. 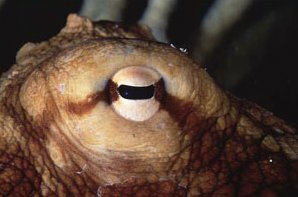 Using its statocyst, a balance organ common to many invertebrates, an octopus can always keep its slit-shaped pupils in a horizontal position. Consequently, the brain can always safely interpret visual information on the basis that the eyes are horizontally aligned, though the body may be at any angle. Like insects, cephalopods are sensitive to the polarization of light. The chromatophores and iridescent cells on the skin of cephalopods can create a visual pattern that coincides with polarized light. Octopuses and squid can recognize these light patterns and since the chromatophore patterns change depending on mating season, behavior, and stress, they can effectively communicate with each other. Polarized vision also allows cephalopods to detect otherwise transparent prey such as jellyfish and ctenophores.